Ladies and gentlemen, I’ve got a problem, and I have a strong sense I’m not alone in this feeling. A 19-year-old young man, Jordan McNair, is dead. He was taken far too soon, and he was taken in large part because he was asked to do too much in extreme heat in order to please a group of football coaches who might hold his gridiron future in their hands. Despite what South Carolina head coach Will Muschamp failed to mention on Friday as he railed against what he sees as the scourge of anonymous sources, one person is most definitely not anonymous today. It’s Jordan McNair, a former lineman, but much more importantly, a former son, a former friend, and someone who was breathing on June 12, but less than 24 hours later was not. I read a response yesterday to Muschamp that indicated the reason anonymous sources must exist in stories like the one that blew the lid off the Maryland football culture deemed toxic and untenable, not to mention unacceptable. Anonymous sources remain anonymous not because they’re “gutless” coach, which is the term you used to describe the staffer that didn’t put his name on his own concerns about how DJ Durkin was running the Terrapin program, but because of people like you. The reason powerful men and women despise anonymous tipsters or sources is because they cannot put a name on the target and cannot enforce retribution against the wind. Thus, to avoid the wrath of vindictive, sometimes dangerous or threatening (career or otherwise) individuals, they stay in the shadows and tell their stories. But, the reason I’m writing about Durkin and McNair today isn’t as much about this one incident. The problem I’m having, the conundrum I’m dealing with, is my own thought process relative to college football or the sport as a whole. I watched Tom Berenger play Paul “Bear” Bryant in 2002’s The Junction Boys, which was based on the Jim Dent novel. A large swath of that story was about how difficult it was to deal with the conditions Bryant pushed on those players. Even then, I perhaps wasn’t phased as much as I should have been, because along with football, we’ve always just sort of accepted that a lot of coaches are jerks that attempt to motivate through fear and intimidation. If you were to sit down in front of a blank piece of white paper and someone instructed you to draw a football coach at work, what would that image look like? I can’t draw, but that’s irrelevant to this thought exercise. Would you attempt to draw a calm man on a sideline with a headset, arms folded, at peace with a grin on his face? Hell no! You would draw a guy shouting, with eyes squinted in anger, probably pointing or throwing something or acting in any number of histrionic ways. That’s what we picture when we think of a football coach. We think of Butch Jones’ head going from normal to beet red, we think of Nick Saban blessing out a kid after a mistake, or we can go to college basketball and remember the Bob Knight method, just as one example. Generally, certainly not all, but many of these men (and women) are not people that come across as stable or well-disciplined, despite what they ask of their players. It’s why I have such a hard time dealing with the reality of just how much power and prestige we hand these men because they’re good at winning games. Who out there really wants to sit down to have a beer with Urban Meyer? Does DJ Durkin come across to you like a fun racquetball partner? The list goes on and on of guys where we can look at them and jump to the conclusion that they’re probably not the life of the party. We don’t know for sure, but we’re nothing in this world if not judgmental based on limited knowledge. Without that being the case, social media wouldn’t exist for any reason other than pet photos. When I read about the Maryland situation last week in the ESPN report, especially the description of conditions inside the program, with humiliation and obese players forced to gorge on candy bars while watching everyone else work out, guys made to eat until vomiting, guys having meal trays slapped out of their hands, guys being cursed at, I didn’t react with the horror I should have, because I kind of feel like this is more the norm than the aberration. What that says about what we’ve allowed that culture as a whole, not just at Maryland, to become, is frightening. There’s a difference between tough love and being a raging jack wagon with a control problem. Muschamp’s response was obnoxious and mind numbingly stupid, and the fact he didn’t mention McNair as he went full-throat to support his friend, DJ Durkin, made me wonder how he coaches the Gamecocks. He’s another guy that we expect to see screaming at the top of his lungs every time a camera picks him up on a sideline. He’s not particularly well-adjusted either, and in his first comments, before revising them Monday to add thoughts and prayers for McNair and then AGAIN defending Durkin, he went after the messenger and not the message. He said we need to “criticize the performance, not the performer.” That’s something we do learn in media, and often it’s a good lesson. But what Will Muschamp failed to realize here is that one performer is dead today because he was asked to engage in a dangerous performance, ended up with a 106 degree temperature, and had a heat stroke. And, when multiple staffers and former players, the latter completely destroying Muschamp’s idea that guys that aren’t getting playing time love to try and get coaches in trouble (you know, because they’re not part of the team anymore) point to a culture and have specific instances in mind to hand to reporters, that’s what we call a history, a trend, or a problem. Jordan McNair isn’t the first player to die amidst football practice, and sadly he probably won’t be the last, because generally speaking, this story hurts our hearts but isn’t going to change how any football program is run in this country, outside of maybe Maryland. 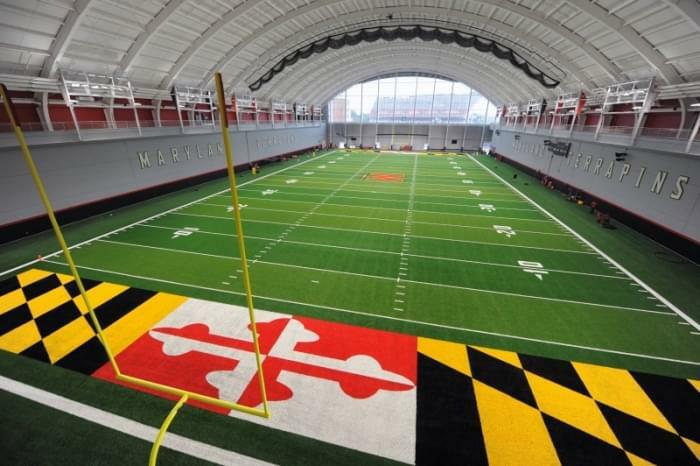 Strength and conditioning coach Rick Court, who Durkin called his most important and best hire, resigned earlier today after reaching a financial settlement with the university. DJ Durkin deserves “due process,” according to the school, but he absolutely should not coach another game in College Park. But, I’m troubled that I didn’t recoil when I read the description of events that went on long before Jordan McNair’s 110 yard sprints and his heartbreaking death. I’ve come to accept that this is just how it is for guys that want to play football on that level. They’re going to get cursed at, they’re going to be treated like animals, they’re going to be ordered around by millionaires that view them as if they’re dollar signs and the equivalent of video game level ups for the coaches themselves. Sadly, I’m starting to think “how awful” shouldn’t begin with DJ Durkin, Zach Smith, Urban Meyer, or even Joe Paterno. I’m feeling more and more that “how awful” should start with what WE have enabled as a sports viewing public. We’ve unknowingly, but nonetheless complicity helped create monsters. Nowhere in society should treatment that if we’re honest, we almost EXPECT from most college coaches, be acceptable, but somehow we’ve just sat back and allowed it. We love football. And we don’t ever enjoy the field trip to the sausage factory. As long as we don’t have to see how it’s made, we can eat it with innocence and bliss. It’s time we took responsibility and began to view things with a different lens going forward. It’s time for a paradigm shift. This shouldn’t be okay. It never should have been. Rest in peace to Jordan McNair, a 19-year-old human being, not merely a college football player, but an impressionable young hopeful, who had so many more years left to live. As we vilify the coach or the culture, report or comment on the story, and attempt to satisfy the “why” of this tragedy, may we not lose sight of the victim here, and may we remember his family.